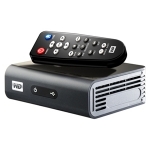 Firmware Western Digital WD TV Live Plus HD mise à jour update upgrade version 1.04.10_B . Installing the new firmware on your WD TV Live Plus is simple. Just connect your WD TV Live Plus to an Internet connection and the WD TV Live Plus will automatically check and notify you a new firmware is available for update at the Home menu. Confirm the action and your WD TV Live Plus will be automatically updated. 1. Extract the three files (.BIN, .VER, and .FFF files) to the root (top level) of a portable USB drive. 2. Connect the USB drive to the WD TV Live Plus Media Player's USB port. 3. Press HOME, and then select the Settings bar. 4. Select the firmware upgrade icon, and then press ENTER. 5. You are prompted to perform the firmware upgrade. 6. Select OK on the firmware update prompt, and then press ENTER. This will restart the system. 7. After restarting, the system automatically enters firmware upgrade mode. 8. Once the update process is completed, the WD TV Live Plus HD Media Player will restart again. 9. Once the HD WD TV Live Plus Media Player restarts, the new firmware is automatically loaded and the WD TV Live Plus HD Media Player is ready for use.